The first expansion for Brotherwise Games’ Unearth will be The Lost Tribe, releasing in July. Unearth: The Lost Tribe, introduces the “Lost Tribe of Delvers,” who have hidden in secret canyons since “the Darkness” destroyed their world. With the Darkness returning, the Lost Tribe has also revealed itself to fight its ancient foe. The expansion set adds new ruins, wonders, delver cards, and a new type of colorless stone to the game to enhance replayability. It also includes components for adding a fifth player as well as a solo version titled Against the Darkness that allows a single player to fight the Darkness over the course of a seven-scenario campaign. 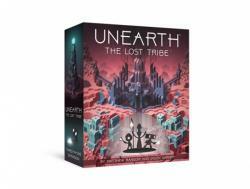 The Unearth: The Lost Tribe expansion comes with 60 new cards, new dice, 35 tokens, and a plastic mini depicting the Delvers. It will be packaged in a disposable tuckbox, and is designed to fit in the base game box.